Identify existing gaps and new opportunities for better addressing the needs of underserved populations. The map above represents a set of strategic choices that colleges consider when implementing the WFS strategy. When starting their journey, college leaders and organizers need to determine who they want to serve. They may continue their path to actual services through existing programs and infrastructure, or they may blaze a new trail by trying something new. The second key decision is to determine which services to provide — high- or low-touch or some combination of both. Choosing community partners to extend services also is important and helps the WFS strategy pick up momentum and deliver greater results. With enough evidence, colleges can generate institutional support and scale up their efforts. 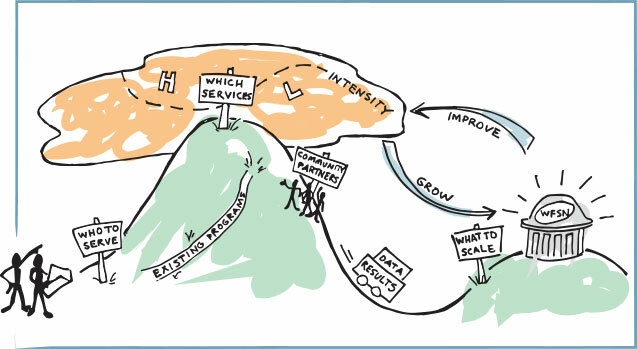 Ongoing feedback and adaptations from integrating services will create an improvement loop that will continue to expand reach and efficiency. Colleges can enhance the effectiveness of their WFS services when they strategically bundle and sequence those services to meet their students’ comprehensive and evolving financial needs. Bundling refers to the combining of services of two or more core WFS areas. Colleges also must sequence those services in a planned, timely way for maximum impact. Students typically gain access to the full complement of WFS support services when they seek assistance with just one particular problem that is threatening to disrupt their studies. Colleges conduct an intake assessment and then counsel the student about the full range of services available to them. If the student signals interest, a coach can work with the student to design a customized plan of action. For example, a student might talk with a coach about a credit problem or difficulty in paying for textbooks. The coach may work with the student to set forth a sequential course of action that first addresses the credit problem, then tackles budget management and savings. The coach and student also may lay the groundwork for long-term financial planning. Many colleges also integrate WFS services into study skills courses, such as the Student Success classes required of all new students entering Phillips Community College in Arkansas (PCCUA). A physical place, likely aligned with student services, workforce development and/or a computer lab. Specific people known on campus as resources to help students identify and achieve their goals. A retention and completion strategy that aims to remove the systemic barriers that students routinely encounter. The “thread and needle” that weaves together a set of services that helps move students toward jobs and success. At some colleges WFS is a physical place—a site likely allied with student services, workforce development, computer lab and other resources—that is seen as the home for the delivery of integrated services. For example, at Phillips Community College, there is a WFS computer lab located within the college’s Career Pathways Center. Central New Mexico has a prominent office suite near the college’s main entrance that houses offices for the school’s Achievement Coaches and is the home base for CNM Connect, the college’s brand for its WFS activities. At many schools, students view WFS as specific people known on campus as resources to help students identify and achieve their goals. At Guilford Technical Community College in North Carolina, students at the High Point campus know that “Miss Sybil” and “Miss Stephanie” are individuals they can approach for assistance with their non-academic needs. These individuals are responsible for bundling or integrating the available services. Another way that WFS fits into colleges is as a retention and completion strategy that aims to remove the systemic barriers that students encounter. Central New Mexico has adopted this perspective with a long-term goal of serving all students across five campuses. The leaders of Des Moines Area Community College’s WFS strategy metaphorically describe their approach as the ‘thread and needle’ that weave together a set of bundled services that help move students toward success and jobs. The college has used its WFS resources to create a data system, called SuccessNet, to track the specific services within the three WFS pillars that students are receiving and to use that information to improve outcomes. Are there existing programs or services that can be leveraged? Is there staff capacity or resource availability that can be shared? Does the target population have a strong existing relationship with any one administrative area? If using a physical location, which administrative area will be able to best manage that center? Which administrative areas are best at working cross-functionally? Where is the leadership that is driving this strategy located? To be successful, the WFS strategy requires breaking down silos within the institution. Working across college functions is vital to implementation, especially if staff capacity is limited. In the case of CNM, traditional college functions were reorganized to break down boundaries. Hence, the WFS strategy can be thought of as a conceptual or operational framework rather than a program. As your college prepares to implement the Working Families Success strategy, the core design elements described earlier will pose a series of design choices. Each of these design choices, in turn, carry a set of considerations that must be addressed to craft the most effective strategy. The following matrix provides some of the Design Choices and Considerations that must be addressed in launching your WFS initiative. Target Population to be Served Entire population. Cohort of most distressed students. Community outside college. Who is most in need? Size of population to be served. The “thread and needle” that weaves together a set of services that helps moves students toward jobs and success. Needs of target population?Resources required? Location within College Academic affairs. Data collection Add to existing system. bridge to existing system. Cost? Colleges should build upon past and ongoing experiences, including other national and regional initiatives that have sought to improve student success; integrate existing programs that draw upon the resources of multiple funders and community-based service providers, and identify existing gaps and new opportunities for better addressing the needs of underserved populations. There are four main ways colleges organize their WFS strategy: a physical place, specific people known on campus as resources, a retention and completion strategy and the “thread and needle” that weaves together a set of services. The WFS strategy requires breaking down silos within the institution. The WFS strategy can be thought of as a conceptual or operational framework rather than a program. Financial education services delivered through one-on-one engagements provide individuals and families with effective tools to manage household budgets, repair credit, modify mortgages, enroll in IDA-matched savings programs and build the assets that can assure long-term financial stability. The Career and Employment Services Center offers a full range of services and activities that include strategies to perform well during job interviews, improve resumes, explore career options and train for high-demand professions. The English Language Institute provides personalized guidance to second-language speakers seeking education, careers and financial stability. The Grove Scholars Program offers need-based student scholarships—as much as $2,500 a semester for a maximum of two semesters—that enable persons from diverse backgrounds and stages of life to pursue Career and Technical Education programs. The Volunteer Income Tax Assistance (VITA) Program offers free tax help for local residents who annually earn $30,000 or less. Students from Skyline’s accounting program provide these services. Other SparkPoint services include opportunities to enroll in public benefits programs, gain access to free and low-cost banking services, learn how to purchase a first home and qualify for discounted utilities, discounted transit fares, low-cost automobile insurance and a free food pantry. For the students, access to the food pantry for emergency food shortages frees up money for college tuition, fees and books. For low-income community residents, the food pantry may be the magnet that draws them to the Skyline campus for the first time. Whenever feasible, the Center offers one-to-one coaching to help students and community residents make the best use of their access to these resources. For example, SparkPoint coaches meet regularly with all Grove Scholars to help them learn how best to manage their scholarship awards and other household finances. The coaches also monitor student progress toward accomplishing their self-declared educational goals as well as helping them improve their job-search skills.